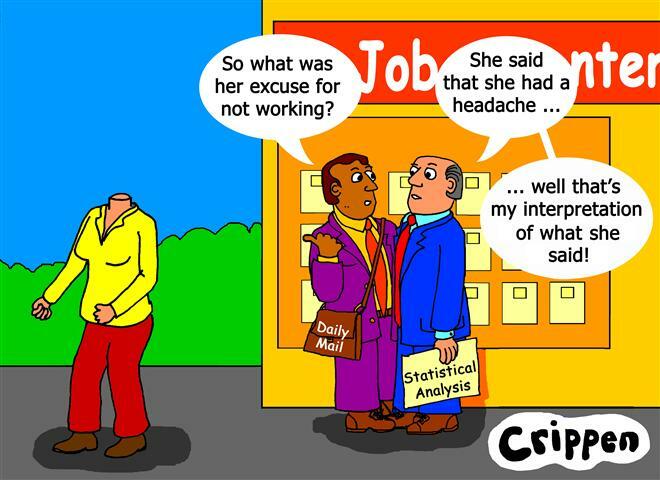 Lies, damn lies and DWP statistics! Incapacity Benefit was introduced in 1995 to replace Invalidity Benefit – both come under the earnings replacement benefit heading. It is important to understand that earnings replacement benefits have a chequered history. Prior to 1971, those unable to work due to sickness or disability were generally not distinguished from other non-workers, and simply received means-tested assistance, if they were poor enough. The 1970s and 1980s were in general periods of expansion and improvement in the coverage of earnings-replacement benefits. However the tide did begin to turn. First in 1980 all long-term benefits, including IVB, were linked to prices rather than being up-rated with earnings as they had been previously. Then through the 1980s short-term sickness benefits became flat-rate (losing their earnings-related element) and responsibility for them was gradually passed to employers. Finally, and decisively, Incapacity Benefit (IB) replaced IVB in 1995: taxable, unlike its predecessor, and with tougher eligibility criteria. For IVB, assessments of incapacity for work could take into account the claimant’s age and qualifications, but for long-term IB the test (at least in theory) is whether there is any work the claimant could perform, regardless of the likelihood of him or her getting such a job or its suitability. A number of issues arise from this period which still haunt us today and makes it extremely difficult to have a meaningful and rational discussion around the ‘benefits agenda’. Firstly, it is a widely held belief that Tory Government’s encouraged IVB claims rather than unemployment benefit in key regional areas in order to mask the true unemployment figures. Secondly, the State has always bound together ‘sickness and disability’ and as a result misrepresented and abused the lifestyles of people with chronic illness and/or impairment. Finally, it should be noted that three years after IB was introducted it became part of New Labour’s first shake up of the Welfare System under Alistair Darling. Labour were concerned by the fact that the ‘disability benefits’ element of the social security bill had between 1974 and 1998 risen from 16% to 27%. This is the background to the rentless campaign that has unfolded since the end of the 1990s against people claiming ‘disability benefits’. DPAC has highlighted how both Labour and the Coalition have employed the rabid Tory press to witchhunt claimants. It is not our argument that there is no need for reform of the benefit system, nor would we foolishly refuse to acknowledge that some claimants might not need the benefits they are claiming; however, we assert that these issues should not detract us from questioning the real agenda behind the so called ‘reforms’ and the discriminatory and disablist manner in which the three major political parties and the mass media are targeting those on ‘disability benefits’. He promised “tough action” after government figures showed 80,000 people claimed incapacity benefits due to drink, drug or weight-related issues. And this shows what exactly? That the world of work makes people ill, perhaps? Having a category such as “depression” or “obesity” masks the nature and degree of the condition, it fails to acknowledge the varied causes of the conditions held within the categories. Alcoholism is for example an extremely complex condition – however Cameron and the mass media are happy to make reckless generalised comments about people with a variety of medical conditions. As a result of their actions the public are encouraged to pin “common sense stereotyped” labels on benefit claimants. The BBC’s chart, for example, are we clear as to what is covered by “drug abuse”? Are there 37,480 “junkies” on benefits or could it just be that this figure includes people who are ‘drug dependent’ due to the nature or treatment of their condition”? This approach tars everyone with specific impairments with the same brush – the social context of impairments are ignored in favour of crude discriminatory stereotyped descriptions. People are drug dependent for many reasons; people can have weight issues for many reasons too – but the Tories don’t want this to be considered. Another question absent from Cameron’s lips and the media stories is: ‘Are these claims within the Social Security rules of entitlement?’ Why is the focus always on the claimants? When was the last time you read in the Daily Mail or heard via the BBC that senior officials at the DWP have been hauled over the coals? Let’s cut the crap – the 21st April marked the latest attempt to instil in the minds of the public that there are two groups of claimants – “deserving” and “undeserving”. This Government has made “impairment” a political issue by asserting through a moral discourse there are acceptable and unacceptable impairments. How dare Cameron pretend to have morals when he has allowed the banking sector get away with immoral acts time and time again? How dare Cameron pretend to have morals when he fiddled his own expenses? We must stand up and oppose the immoral way in which people with impairments are being scapegoated as an excuse for dismantling the Welfare State.